The End Of The March 8 Alliance? That quote from the Daily Star article (entitled March 8 finished, Aoun out in the cold) sums it up. But Is really Aoun out in the cold? Or is it some kind of an ingenious Berri tactic? No More Sacrifices For Allies? Rewind to June 2011: A small dispute (Called back then العقدة السنية, meaning “the Sunni Knot”) between Hezbollah’s Sunni allies (Mikati and Karami) over the number of posts that should be held by each of them delays the government’s formation. In a government of 30 ministers, there should usually be 6 Sunnis and 6 Shias; Mikati’s government eventually had 7 Sunnis and 5 Shias. It was Berri back then who untied the knot by sacrificing one minister of his share for Ahmad Karami. This time, Berri made his preemptive move as the Salam cabinet formation is clearly facing difficulties. By declaring the 8 March Alliance dead, Berri is dissociating himself from his allies: He will no longer be pleasing them from his share should they want an extra minister. He is making it clear for Tammam Salam that he is not letting go a minister so that the coalition doesn’t collapse like he did in 2011. According to Gebran Bassil, “Political lineups have been shattered”. By getting too busy analyzing the small details, the big picture became unnoticed. While Michel Aoun was busy shattering the March 14 Alliance into pieces via his Orthodox Gathering Law, the other side was preparing to strike back. March 8 knew what was March 14’s Achilles’ heel, but the opposite is also true. March 14’s counter-attack didn’t take long. After the May electoral confusion that nearly destroyed the ties between Gemayel, Geagea and Hariri, March 14 made their move. It was clear that Aoun wanted elections he was going to win, while Berri saw the extension as an alibi to stay 17 extra months as a speaker. 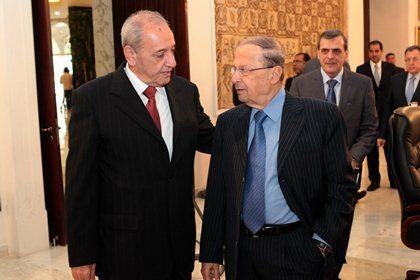 It was clear that Aoun wanted his son-in-law Shamel Roukouz to succeed Jean Kahwagi as a Commander of the army, while Berri had no interest in it. It was also clear that there was a tense atmosphere between Berri and Mikati that developed into a constitutional crisis. The plan was very simple: Let time play its role: Postpone the governmental formation until the M8 Alliance collapses. With no government, the extension of the parliament’s terms was an easier job while the constitutional crisis became evident with the appearance of certain deadlines that were irritant to Aoun and Mikati: One doesn’t want an extension of Kahwaji’s term, the other doesn’t want to see the parliament legislating in the presence of a caretaker government (probably to appear as the protector of the Sunni interests in Lebanon). Thus M14 played it smart : They stood by Berri when he wanted to extend the parliament’s term, then blocked all the speaker’s attempts to hold a session by standing with Aoun and making sure that there will be a lack of quorum. All it took was 1 month of conflicting interests between the M8 members to (apparently) end a 7 year alliance. All it took was letting the M8 alliance rule and fail due to the lack of chemistry between its parties. Political alliances are usually built on the foundations of the electoral alliances. In no electoral district the FPM and Amal find themselves forced to ally with each others to win. No Aounist is elected in a region having Amal votes, while no Amal MP is elected due to Aounist help. In fact, the two parties were an exception in 2009 when they ran against each other in Jezzine (while they were allies), making it easier for M14 to have a seat in the district (even if it didn’t eventually win any MP in the constituency). Once they don’t need each other to get into the parliament, the two parties won’t stick together till life in the parliament. Geagea needs Hariri to secure him MPs in Zahle and Akkar. Jumblatt and Hariri need each other to prevail in the Chouf. Baabda is ideal for an FPM-Hezbollah electoral alliance, and the Kataeb need the small Sunni and Druze votes to prevail in certain constituencies. Out of all the alliances, the easiest one to break was the Berri-Aoun one, because it had no electoral basis. À La Adnan Sayyed Hussain? Berri is apparently distancing himself from the Hezbollah-FPM duo and getting closer and closer to the “centrists”, comprising Jumblatt, the President, Mikati and – who knows – Salam. Salam was trying for the past 4 months to get his formula of 8/8/8 ministers (8 for centrists, 8 for M8, 8 for M14) accepted. Once M8 ceases to exist, Hezbollah and Aoun may get their share of 8 ministers independently from Berri, who would be taking a part of the centrists’ share. Once again, Rewind to 2011: A minister supposedly centrist resigns from the Hariri government (That included 10/30 of the ministers from the opposition). The resignation of the eleventh minister, Adnan Sayyed Hussein, who was theoretically a minister loyal to the president, brought the government down (after more that the third of the ministers resigned). Berri might be planning the same strategy again: By announcing the end of the March 8 alliance, he is in fact trying to ensure the blocking third in the government for the “ex-M8” members (by pushing himself to the center away from Aoun). M8 might be playing dead in a last attempt to maximize its share in the government. So Is It The End? If you consider that the March 14 coalition doesn’t exist anymore, than you are right to consider the March 8 coalition destroyed. Perhaps it is true: Nobody knows where Jumblatt stands – actually nobody ever knew – while Mikati and Berri are distancing themselves from everyone. On the two other sides: Hezbollah and the FPM struggle alone while the OG law spread confusion and cautiousness between Geagea, Gemayel and Hariri. One thing is sure though: If M14 and M8 are truly from the past now, than they fought themselves till collateral damage prevailed. Only know you love her when you let her go. Time to see what alliance members truly love each others.